Som Tum is the most popular salad in Thailand, you can see stalls selling it at almost most corners of the streets in Thailand. 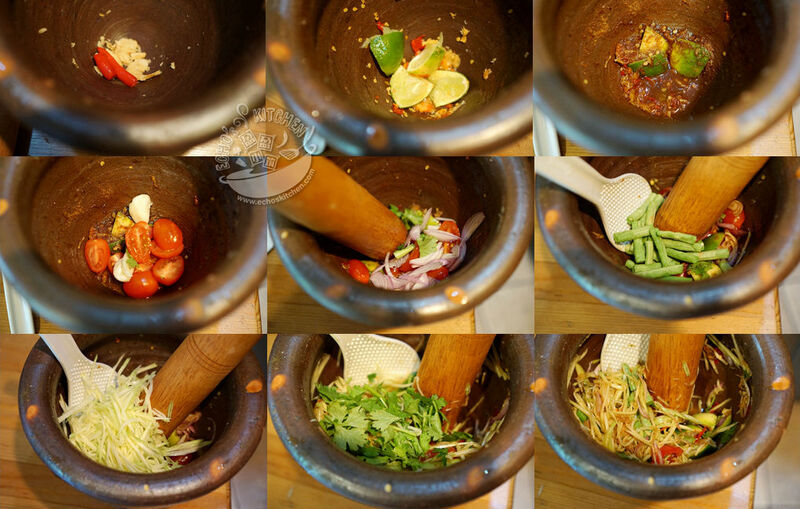 There are many types of Som Tum in Thailand with various kind of ingredients and seasoning. 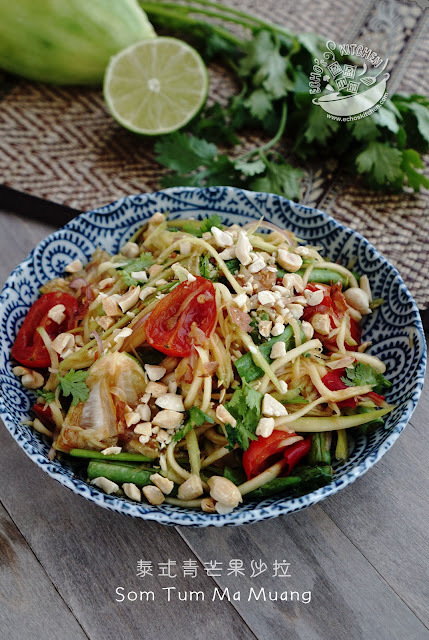 The recipe I make today is called Som Tum Thai, the sweet and sour version. 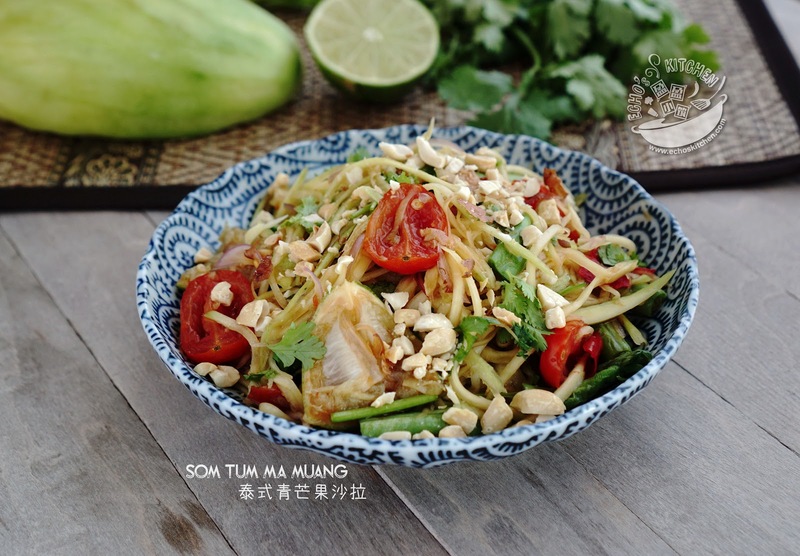 The two most popular types of Som Tum Thai are green papaya salad and this green mango salad, though the greens and ingredients may vary a little, both the Som Tums are pretty similar. A very good friend of mine MiuMiu, who loves Thai foods a lot found Thai-Laos Mortar/Pestles from a Thai/Laos store, and she was such a darling to send me one all the way from NY! With the right tool and good green mango that I found at a local Indian store, I am ready for a plate of Som Tum Ma Muang on this hot summer day! 1. 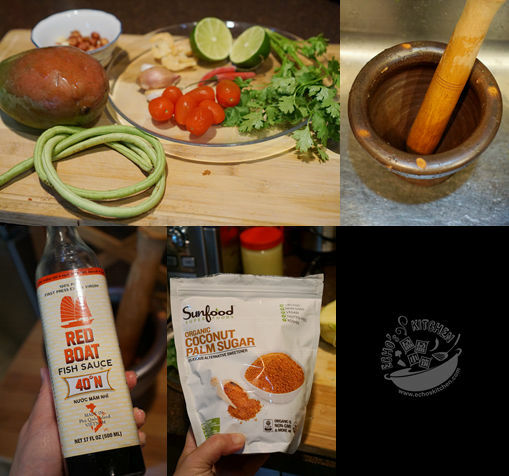 These are the ingredients I used for my Som Tum, my cute Thai/Lao Mortar & Pestles, my favorite Fish Sauce and the coconut palm sugar that I used. 2. 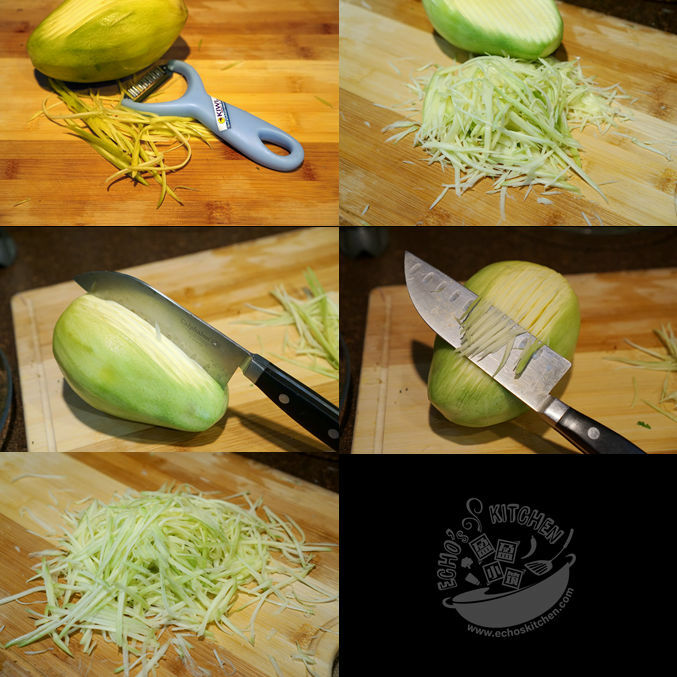 Start by peeling and shredding the green mango, you can use a julienne peeler to do this, if you do not have this type of peeler, you can also shred the mango by making multiple cuts lengthwise on the mango using a sharp knife, do this over and over until you have good amount of cuts which resemblance thin strips, the cut should be pretty deep so that you can produce good amount of long strips without having to repeat the process too many times. Slice the cuts lengthwise to produce long thin shreds. 3. Clean the mortar and pestles, place dried shrimps in it and pound until it is crushed, add thai chili and garlic clove, pound until crushed and smell releases. 4. Squeeze in half a lime worth of juice, you can also cut the remaining of lime into pieces and place them in the mortar. Add fish sauce/Nam Pla and palm sugar, pound until the palm sugar dissolved. 5. Halved and add the cherry tomatoes, you can now reduce the force of pounding as you want to pound enough to crush the tomato and release some juices but it should not be too hard that it smashed the tomatoes and loses its shape. 6. Add the thinly sliced shallot and yard bean/long bean that is broken into 2 inches long. Pound a few time and with the help of a big spoon, mix the ingredients together. You can check the taste now and adjust the taste with lime juice, palm sugar or Nam Pla if need so. 7. Once you are happy with the taste, add shredded mango and cilantro, pound and mix until the juices and all ingredients are well mixed. 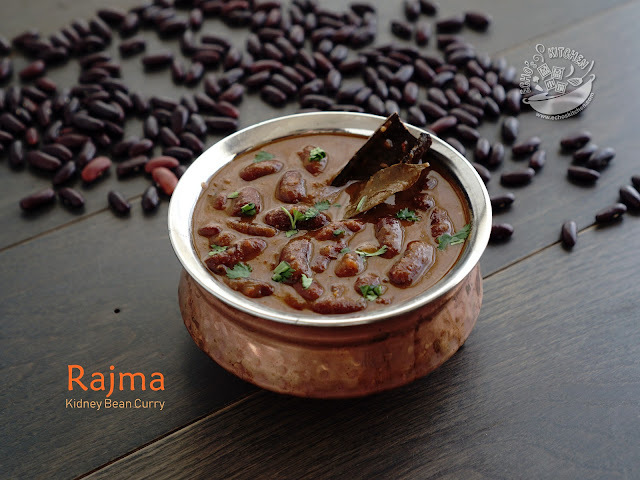 Serve immediately with some crushed roasted peanuts on top.